It’s thirty years this month that the first collaboration between Merfyn Owen and Allen Clarke crossed the start line. Rupert Kidd sailed the newly launched 35’ x 33’ wide, gull winged trimaran Fiery Cross (named after the famous Clipper Ship) to a second in class in the 1988 OSTAR. Leading his class and all but one of the new forty footers by a margin, Rupert struck an unidentified object, broke his three-metre dagger-board and finished second in Class into Newport RI. 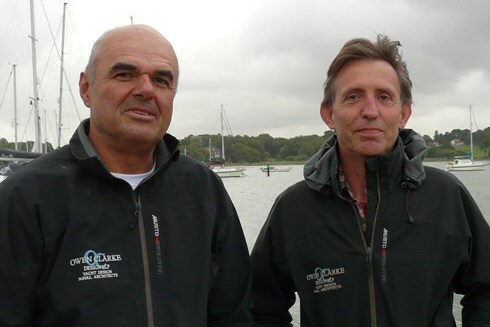 Rupert and Fiery returned and went on to win their division in the double-handed Round Britain Race the following season. The radical ‘as wide, as long’ concept was developed during Merfyn’s last years at University College London in 1985/86, where after learning that no VPP (velocity performance prediction programs) existed at that time he developed and wrote the first of its type in Fortran 77 as part of a final year project. Racing with the experienced Rupert Kidd on the 30’ Kelsall tri, Applejack, helped develop the practical side of the design, including the swept forward, high gull winged beam geometry that the little boat shared with the stunning Adrian Thomson designed Paragon. In ’87 while Apricot was being built in Portishead and Paragon in Totnes, Owen leased half the yard at Curtis and Pape in Looe, where Sir Chay Blyth built and launched his 65’ tri Brittany Ferries GB. Joined by Pete Milwidsky, an engineer and friend from university the pair began mould building that Spring. During the Summer they were joined by students and former students from the school of yacht and boat design, Southampton. Among them was Allen Clarke, also a graduate of Falmouth Boatbuilding School. Allen and Merfyn teamed up to design their first boat together, a 30’ racer-cruiser catamaran in 1992 and followed this up in ’93 with the design and build of Maverick, their first monohull. Aptly named, Maverick was developed to win the Karrimor Three Peaks Race; sported a carbon fibre lifting keel, water ballast, twin rudders and weighted a mere 1.5 t on a beam of 13’. There has followed twenty-five years of innovation and design driven by experience, time on the water and always a modern forward-looking technology driven approach across a wide range of craft. 2018 will see the launch of our first aluminium design, a 66’ lifting keel expedition yacht designed for commercial high latitude charter and cruising. As well as the announcement of the largest, fastest and most complex design we’ve ever worked on. This story of an enduring friendship, team-work and innovation goes on.